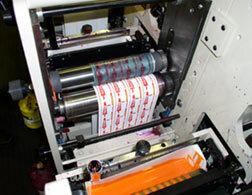 Frequently asked Questions about flexo-printing. • This system can be well suited for a wide variety of materials including acetate film, plastic, paper, newsprint, and polyethylene. • Flexo-Printed materials are paper products and not weather proof, therefore only indoor use is recommended. • Flexo-Printed inks vary slightly in color from our standard screen printed inks.